If you’re struggling to get to sleep at night, try out these tips for getting quality rest. One of the best things you can do for your health is get a good night’s sleep. It is honestly tied to just about everything else in your life: your stress level, your energy, even your ability to make good food choices! But it’s hard to get a good night’s sleep when you have trouble falling asleep. You toss and turn, get too hot and throw off the covers, get too cold and find them again, roll over on to your other side, but nothing works. 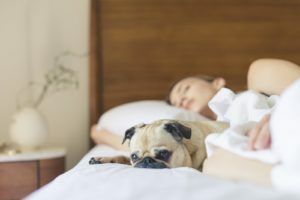 Here are 3 tips to try the next time you have trouble falling asleep so that you can get back on that healthy sleep schedule. Screens are literally all around us nowadays, but all that blue light isn’t good for our sleep. Most electronics, especially phones, emit blue light waves, which actually interfere with melatonin. Most phones have a ‘bight mode’ that filters out much of the blue light, but an even better rule of thumb is to cut out the electronics at least 30 minutes to and hour before bed. And if you’re having trouble sleeping, resist the urge to pull out the phone and scroll Facebook – it won’t help you sleep, and the light may actually keep you awake. Ok, ok, easier said than done, of course. But the truth is that the more wound up you are, the less likely it is that you’ll fall asleep. Stressing about how much we need to sleep can actually make our hearts beat faster in response which wakes us up even more. Instead, sit up and take some calming deep breathes to help ease your stress. Breathe in for four seconds, hold it for seven seconds, then breath out slowly for eight seconds. Do this four or five times till you feel yourself relax a bit, then try to sleep again. The root of that old advice to count sheep was probably that sheep are boring and so is counting, but a lack of boredom is not what’s keeping you awake. In fact, conjuring up a moving mental image of sheep and then counting is working your brain, not relaxing it. Instead, picture a still, quiet, peaceful place: an open field, a quiet beach, or a pretty meadow. The serenity of the scene is what will help lull you to sleep. This entry was posted on Friday, February 1st, 2019 at 2:06 pm. Both comments and pings are currently closed.